If you work in SEO or aspire to do so or are looking for this work, you are going to or at least you should come across an SEO proposal. Understanding how to create one will help you land more jobs, better paying jobs and if you are on the other side of the coins, it will help you identify the prepared SEO specialists from the unprepared ones. In this article, we will talk about what makes a good SEO proposal. Know what you are talking about. Don’t BS anything. Don’t make promises that you can’t keep. That is bad for everyone. If a client asks for a guarantee, don’t respond to that. Explain to them why you cannot make a guarantee because of the nature of SEO. The client will appreciate your honesty and likely dismiss any other SEO specialists now that you explained this too him. Keep things short and sweet. In most cases, the client will not have much of an idea of how SEO works. All they want is to rank high for keywords. Explaining everything to them is only going to make their head spin and could likely intimidate them which could result in a lost job. Keep things easy for them to understand. Think about it. Would a handyman contractor explain to a home owner how plumbing works? No.They tell them “this is what we will do, this is how we will do it and this is what you should expect”. Outline your work. Not too detailed but go over everything that you will be doing for them. If they see their keyword jump from 8th to 7th in a month, it may not look very appealing to them so it is important that they know roughly what your plan of action will be. Another difference between this kind of work and the work that a handyman contractor would do is that the homeowner is able to see the contractor working everyday. The site owner is not able to see the backlinks that you are creating each day so you have to pay extra attention to this step. Set goals. Not guarantees, you don’t want to do that but it is okay to state where you expect to be at what time or declare what constitutes as progress. For example, you can say that you will have 3 of the 10 keywords on the first page in 3 months. This gives you a lot of flexibility and it is very tough to go wrong here. If some of the keywords are not working out as planned, you will have the others to bail you out. The client can reference this goal with the results and they should be at least satisfied. You can also set goals like “the average keyword position for this set of keywords will rise”. As long as more rise than drop, you have this simple goal achieved as well. When you are creating an SEO proposal, make sure that your client knows what to expect and that SEO is largely unpredictable. 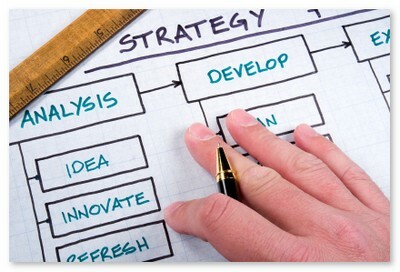 Define your strategy and do your best to reach the goals that you set with the client.